Property 2: NEW! Rock City Writer's Studio: Bucolic Setting, Nordic Sauna, Walk to Town! Property 3: Top-rated luxury/romantic hideaway w/stream + mtn views: 5-min walk to village! 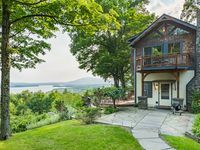 Property 7: New Magical Romantic Catskill's Cottage. Outdoor Hot Tub and Amazing Views! Property 8: NEW! Beautiful luxury getaway in "the most perfect location in Woodstock"
Property 11: BRAND NEW Mountaintop Log Cabin in Pine Forest, 1.5 Miles to Town! Property 12: NEW! Herb Cottage: Historic Artist's Cottage, Wood Stove, Walk to Town! Property 14: Mountain Stream Retreat: rustic elegance, decks overlooking stream, wood stove! Property 22: NEW: Architect-designed historic CARRIAGE HOUSE w/heated pool, AC, walk to town! Property 23: Best of Both Worlds: Mtn Views, Fireplace, Pool, Walk to Village Green! Property 24: NEW: Arts+Crafts original perched on terraced mountainside w/breathtaking views! Property 25: Just steps away from the Rondout waterfront. Property 28: Village Center: Gracious & Spacious Retreat "Above the Books"
Home on scenic country road, easy access to town, Belleyre & Hunter Mountains. Property 30: Home on scenic country road, easy access to town, Belleyre & Hunter Mountains. Property 38: Where the Broadway Stars Vacation! Private Woodstock getaway & walk to town! 'Casa Reál' Expansive Woodstock House w/ Hot Tub! Property 41: 'Casa Reál' Expansive Woodstock House w/ Hot Tub! Woodstock mountainside retreat, nicest view in the Catskills!! RELAX!!!! Property 42: Woodstock mountainside retreat, nicest view in the Catskills!! RELAX!!!! We had a very pleasant stay at the carriage house. It is ideally situated in the heart of Woodstock. You can walk into town and access hikes very easily. The house is beautifully designed and feels very homey. Everything was clean and easy to use. In fact, we liked our stay so much that we immediately booked it for another future visit.